The Food Safety MasterClass is an on-demand webinar, providing a step-by-step guide on how to prevent physical contamination in food products. It discusses causes of product recalls, the importance of zero contamination and how to achieve food safety in 6 steps. Listeners can also learn more about four main trends in food safety inspection. Originally hosted by the UK publication, New Food, on-demand viewers can gain additional industry knowledge from the recorded Questions & Answers session. 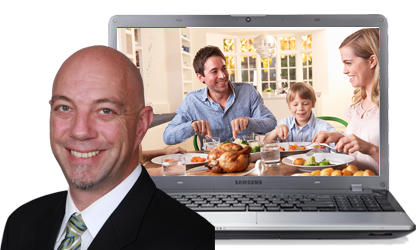 The Food Safety MasterClass webinar was held on the 3rd October 2018 and presented by Robert Rogers, Senior Advisor Food Safety & Regulation at Mettler-Toledo Product Inspection Division. Gain additional industry knowledge from Robert as he answers the questions following the live webinar. How can I protect rejected products from re-entering production? Many standards and regulations are now being written that non-conforming product must be diverted to a secure area, accessible only by authorised personnel. This means that a non-conforming product should be rejected physically into a secure bin that is only accessible by those that have been properly trained on either how to reinspect the product, rework the product or dispose of that product. In your experience, what are the most difficult packaging materials to inspect? Metal detectors work of a conductive principle where conductive materials have an effect on the output of the metal detector. Running a package that has conductive materials within i.e. a pie that is within a foil tray, heavy metallised film or foiled packaging, can be challenging for metal detection applications. X-ray inspection isn't affected by the conductive nature of the packaging, which means that the packaging material has no effect on the results of x-ray inspection. Many points need to be considered when selecting the right product inspection solution for each individual food application/product. I would always recommend completing a product test to determine the best solution. Can you explain the difference between HACCP, HARPC and VACCP/TACCP? HACCP stands for Hazard Analysis Critical Control Points whereas HARPC stands for Hazard Analysis Risk Based Preventative Controls. HARPC is specific to the new Food Safety Modernization Act that has been implemented in the United States. These programs are for unintentional adulteration. VACCP stands for Vulnerability Assessment Critical Control Point whereas TACCP is Threat Assessment Critical Control Point. These are aligned with requirements to prevent intentional adulteration within FSMA. This is achieved by assessing the vulnerability of a facility and identifying ways to control them as well as calculating the threat of potential intentional adulteration. Does x-ray inspection have any effect on the product? And, are there any health hazards? When people hear x-ray, they think about radiation and they get scared. Certainly, an x-ray device is a radiation producing device. The way that they produce x-rays is through an electronic tube as opposed to a radioactive source so there is no radioactive source within it. We create x-rays through a very safe manner via a tube electronic system. When power is applied we generate x-rays; as soon as the power is disconnected there is no more residual x-rays or radiation that is left over. As x-ray systems are radiation producing devices there are regulations around the design and operation of the system to ensure safe operation. There are federal guidelines in the United States, as well as other countries and regions, where requirements may differ slightly. X-ray inspection systems are now common place in manufacturing facilities and all must comply with pertinent regulation for safety where they are installed. During inspection of products, the quantity of x-rays is low, the energies of the individual x-rays are relatively low and the inspection period is very brief. Products under x-ray inspection are typically exposed to low energy x-rays for less than 0.2 seconds. The dose levels of background radiation received by products while on the shelf, in transit, or during the time they are owned by the consumer are much higher than the levels delivered by an end of production line x-ray inspection system. The US Food and Drugs Administration (FDA) estimates the dose level received by an object going through an x-ray inspection system is lower than the background radiation dose level for one day. Moreover, the FDA asserts that there is no known danger to consuming products that have been inspected by x-ray. We have a corn mill and we only have metal detectors – is x-ray inspection more appropriate for our process? Or, to better prevent risks, is it necessary to install metal detectors at each stage of our process? As far as the inspection type, whether adding x-ray inspection into the process would have any benefit, would depend upon whether there are any hazards or potential risks of hazards that x-ray inspection would be able to identify that metal detectors would not. Typically, in the mill, depending upon how early in the process raw corn is coming in, maybe a bulk x-ray inspection system could look for any field debris i.e. any hard plastics, stone or glass coming from the field directly. As far as inspections throughout the production process, I would recommend at identifying physical contaminants as early as possible before further value is added to the product. As you begin to mill that product you are adding more value. As it goes through each stage of the process you are adding certainly more time, more man hours, more resources and more ingredients. By inspecting the product early in the process you can reduce waste, improve efficiencies and even protecting some of the processing equipment. The ideal scenario is to have a type of product inspection system at all stages of the production process – beginning, in-line and end-of-line, ensuring outstanding product safety and quality while reducing production costs and product waste and improve efficiencies. You have already added value, time, energy, resources in producing that product just to find a problem with it and throw all that effort, packaging, energy into the reject bin and dispose of that product. This can increase waste and decrease efficiencies. These are some of the key factors to consider when trying to determine where is the right location for the inspection devices, or multiple inspections throughout the process. How can you overcome false rejects of non-contaminated products? The way to set up systems, whether metal detection or x-ray inspection, is for them to successfully inspect production - this is the key to minimize the likelihood of any false rejects. False rejects are the worst enemy as a good, saleable product is now in the reject bin. These products will either be thrown away as waste or more time and effort will be invested to rework the product – which shouldn’t have been rejected in the first place. 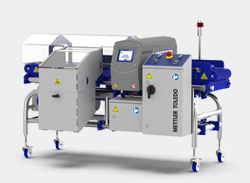 In some instances, false rejects may occur − but modern metal detection and x-ray inspection systems advanced software and fully automated product set-up helps eliminate false reject. Which entities have approved the use of x-rays in the food industry? 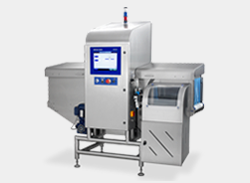 The use of x-ray systems in food and beverage is very common. Many retail codes of practice now require x-ray inspection to be included in foreign material prevention programs. This is to identify and detect non-conductive contamination that may be difficult to find by standard metal detectors. In fact, many believe both technologies are needed to provide the highest protection against non-conforming food entering the marketplace. There are specific regulations regarding x-ray inspection systems and radiation. Those can be different in various countries around the world. Overall our x-ray inspection systems well exceed the most stringent standards globally and are totally safe to use. Which technology (metal detection or x-ray inspection) is higher in life cycle costs? I am aware of metal detection systems that are over 20 years old and still operating in production today just as they did on the day they were installed. We also currently have x-ray systems that have been installed for more than 12 years. If you support and service your product inspection equipment through its entire lifecycle, from installation to preventive maintenance and performance verification to equipment repair, this will certainly help to prolong the life of the system. In relation to bringing new product into the marketplace in the US, is there the equivalent as the European Prevention Principle? All products manufactured or sold in the US need to meet the minimum requirements if regulated by the Food and Drug Administration (FDA) or US Department of Agriculture (USDA). There may also be requirements that the individual facility, retailer and/or brand owner may need to comply with as well. As a minimum Good Manufacturing Practice (GMP) and Hazard Analysis Critical Control Points (HACCP) principles should be applied. Does digitalization remove the need for online checks? What is the best way to review this within our site as a novice within the area? Food manufacturers are increasingly looking to use more intelligent systems to improve automation and traceability within their plants. Connected manufacturing across networked infrastructures can improve production line efficiencies and management control. However it is always best, at a minimum, to test the system prior to operation and at the end of the production run to ensure proper operation. I have a metal detector that sometimes gives false positives, what would be your recommendations? You must ensure it is installed properly and stable. It should be set at maximum sensitivity levels with no product running. If it is not stable, I would suggest a service visit. If it is stable, you should adjust the sensitivity levels to successfully inspect the product, with no false rejects, then test the system to determine detection capability. With such a drive for digitalization, do you not think that this just opens the door to new methods of tampering and extortion from a cyber perspective? Even with the uptake of Blockchain type solutions and distributed ledgers, most of these systems will have access control restrictions. However it will be important to continuously improve security both physical and cyber. What would you recommend when inspecting for fish bones? We have been informed by our x-ray supplier that they are not dense enough to detect. Product testing can be conducted to determine detection capabilities based on the specific application, please get in touch with your local office for more information on product testing.